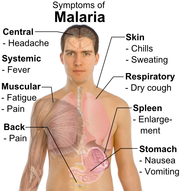 Malaria is an infectious disease caused by the protozoan parasites of the genius plasmodium. Humans can be infected by P. falciparum, P. malariae, P. ovale, P. vivax and P. knowlesi. Transmission of Malaria is caused by female mosquitoes of the Anopheles genus. The female mosquito ingests the malaria parasite by feeding on an infected human. In rare cases Malaria can even be transmitted through blood transmission. 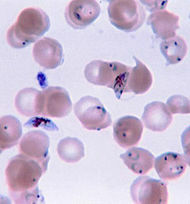 Symptoms of Malaria: fever, shivering, arthralgia (joint pain), vomiting, anemia (caused by hemolysis), hemoglobinuria, retinal damage and convulsions, children with malaria frequently exhibit abnormal posturing, a sign indicating severe brain damage and in extreme cases if not treated, coma and death. To prevent the spread of disease, or to protect individuals in areas where malaria is endemic, people use mosquito nets and prophylactic drugs. There are several different types of drugs used to treat Malaria. Vaccines for malaria are under development. When properly treated, someone with malaria can expect a complete recovery.